About Commissions - what are they? A commission is a painting, painted by me, as you would like the painting to look. Commissions are a very good solution for many people interested in my rose paintings as long as it is a reasonable fit to my style of painting. 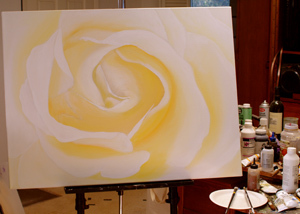 As an example, if you were interested in a white rose with yellow highlights, the painting above would represent your painting partly completed. As the painting developed, I would send progress reports and even photos if you would like to see the painting before completion. Most people prefer to know how the painting is going but like to wait for the completed view. My purpose with commissions is to give you a painting as you would like it to be. But there is always a slight variation from the original composition and sketches. The variation is simply the rose painting taking on a life of its own. That sounds strange at first but letting a painting evolve is a nicer way to paint. Forcing a scene to fit the original composition loses some creativity and spontaneity. 40" x 48", Oil on Canvas How does a commission work? 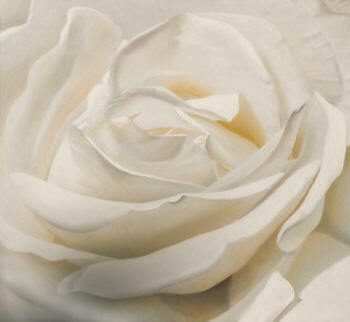 A rose painting commission is request from you, asking me, to paint your ideas for a rose painting. This is different from my painting my idea of a rose scene and placing the painting in a gallery. In many ways it is a better idea! It makes for a better fit for both you and the painting and even for me. Commissions are a simple idea and the best of all possible worlds - you get the painting you would like and I enjoy the process of creating your painting. Commissions start when you contact me through the "Contact Me" page. There is no obligation other than the beginning of a conversation about a painting for you. There is no financial commitment and I will not take your email information and try to sell you something later. I will not use your email except to continue our conversation. If we find there is a possible painting I could paint for you, we will then talk financial issues but not until we have agreed to do so. I will not try to sell you a painting, we are just talking about your ideas for a rose painting. I am not a sales person, I am an artist. If we do find that you would like to commission a painting, we will talk about the financial side of the project. I will ask for a percentage of the cost of the painting up front. After agreeing on the financial details, you will suggest ideas for your rose painting. I will need to know basics like rose color and type, and if you have a favorite rose. I work from both photographs and the real rose so I will need to be able to buy the rose or to have access to the rose in a garden. I will take a series of photographs and send you some ideas by email. We will go back and forth for as long as it takes to find a rose, a color, a size, and composition, that is right for you. The essential point here, is to find a composition that you like! The color can be a real rose color or a creative color that appeals to you. We will decide on the composition and size of the painting and I will send you a final image that we agree on. You will then send a small percentage of the painting cost for me to begin the painting. As the painting progresses, I will send updates and photos if you would like to actually see the painting in progress. When the painting is complete I will ship the painting to you for your approval. On your acceptance, you will send a check for the remaining cost of the painting. This process is a very good compromise in finding the perfect painting for you and for me to find people who enjoy my work! It also allows me to know what you like in paintings and helps me to know the person who is buying my work rather than just hearing after the sale. If you have any questions on commissions please contact me through the Contact Me page and I will answer your questions. There is absolutely no obligation - it is simply a conversation about roses and rose paintings.